Nvidia GeForce 6200 Drivers on Ubuntu 7.04 Feisty | Next thing to do! I tried to install Ubuntu 7.04 on a computer with a GeForce 6200 graphic adapter. It’s possibile to use non-free drivers for the card by the menu System→Administration→Restricted Drivers Manager. It’s better to make a backup of the file /etc/X11/xorg.conf. I suggest also to launch it as user to avoid to save changes permanently : you can see a preview of the modified settings. 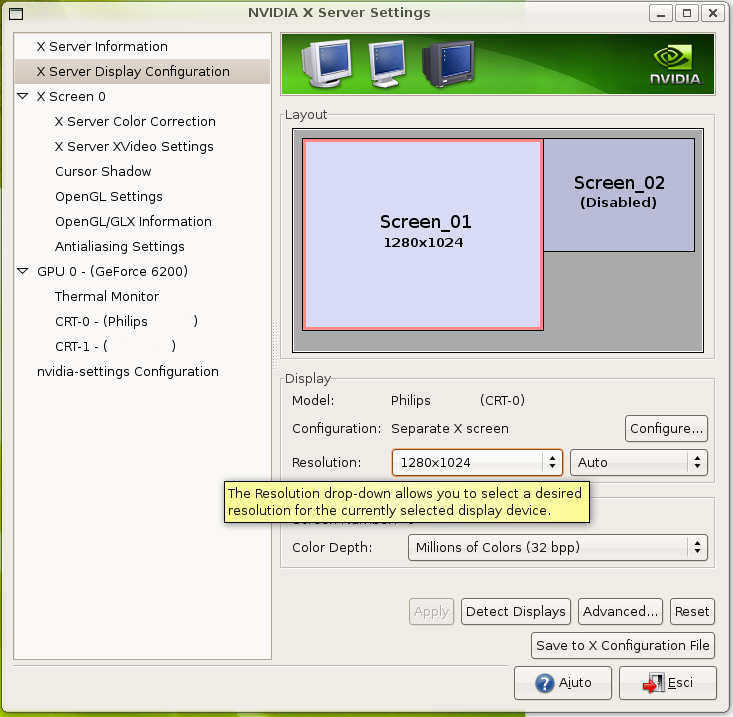 Through this panel you can adjust settings of your graphics adapter, enable Separate X-Screen or Twin-View. In the bottom of the panel the button “Apply” allows to verify changes made. This useful tools works fine and it’s very easy to use. You can save current configuration with the “Save X configuration file” that replace your current xorg.conf file if you launch the panel as root or with administrative rights. I don’t suggest to make it but you can see (and copy in a text file) a preview of the modified xorg.conf file before save it. The main problem is that generated configuration file doesn’t work with the Ubuntu xorg.conf management. I hope to solve as soon this problem. I’m using modified setting by applying them and exiting from the tools. A possible solution is to make a comparation of the original xorg.conf file and the modified xorg.conf file generated by the tools to enabling only options you need. Next days I’ll work to solve this issue…. Entry filed under: hardware, linux, Ubuntu.